Due to what they say is a lack of judicial and procedural guarantees, four prominent Venezuelan journalists who were criminally sued for continued aggravated defamation and aggravated injury (injuria), chose to leave Venezuela, according to the statement they sent to the national and foreign press. "One of the things that forced us to leave (Venezuela) is that they told us that we had no chance of winning the trial. The judge in charge of the case never found in favor of someone other than the government, and we know that from our investigations and the database we have," Armando.info journalist and co-founder Alfredo Meza told the Knight Center. 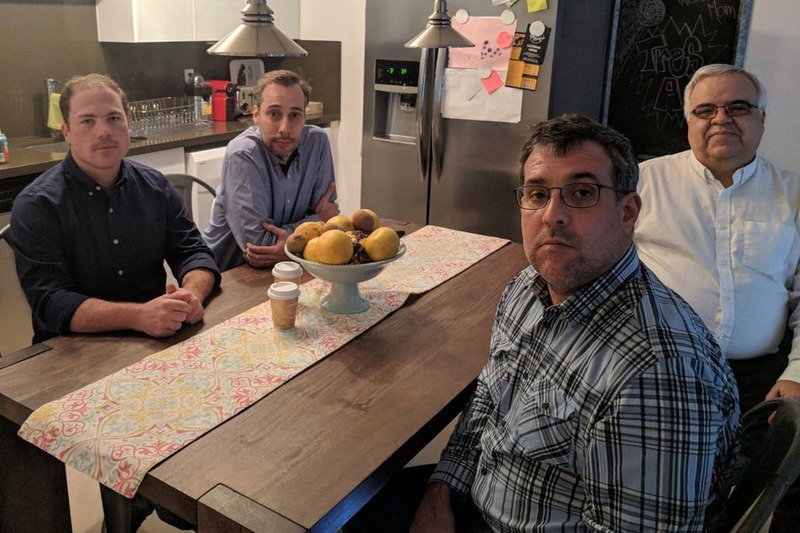 Journalists Meza, Joseph Poliszuk and Ewald Scharfenberg, founders and editors of Venezuelan investigative journalism site Armando.info, and Roberto Deniz, a reporter for the site, were sued in September 2017 by Colombian businessman Alex Nain Saab Moran. They could each receive from one to six years in prison, plus a fine of up to about US $59,000 for both crimes. According to these journalists' reports, Saab has had a commercial relationship with the Venezuelan government since Hugo Chávez was president. Scharfenberg said on journalist Jaime Bayly’s program on MegaTV that one of Saab’s lawyers is Amir Nassar, who Scharfenberg said is the lawyer of current President Nicolás Maduro and of the vice president of his political party, Diosdado Cabello. According to the journalists’ statement, Saab says that his honor and reputation have been affected by the statements contained in two of the site’s publications, both written by Deniz. The reports in question are “Businessmen questioned in Ecuador and the U.S. sell food to the Venezuelan Government," and "From Veracruz to La Guaira: a trip that unites Nicolás Maduro and Piedad Córdoba,” published in April and September of 2017, respectively. The articles in question say that Saab has financial ties, through the company Group Grand Limited of Mexico –which is allegedly controlled by a Saab company in Hong Kong– with the Venezuelan government's program to fight hunger and malnutrition, Local Sourcing and Production Committee (CLAP, for its acronym in Spanish). The CLAP boxes contain foods imported from Mexico and are distributed and sold at reasonable prices among the most impoverished sectors of the Venezuelan population. Scharfenberg told W Radio of Colombia on Feb. 6 that their investigations show Group Grand Limited is a company controlled by Colombian businessmen, Saab and Álvaro Pulido Vargas, through an offshore scheme. "Both have already had with President Hugo Chávez, full access to the highest levels of power in Venezuela," he said. According to the Armando.info journalists, the investigation of the second article pointed out in the lawsuit tracked the statements made in Brazil by Luisa Ortega Díaz. Ortega Díaz, former Attorney General of Venezuela, was deposed in August 2017 by the new Constituent Assembly after 10 years in the position. In August 2017 at the summit of Mercosur prosecutors in Brasilia, the former prosecutor denounced alleged acts of corruption incriminating Maduro and the Saab company in the CLAP box food import business. Roberto Deniz –the author of the articles at the center of the case who has investigated the CLAP box program since it started as a temporary measure of the government in 2015 –told the Knight Center that the state program had a whole business framework that aroused suspicions. It was rare, the journalist added, that the importation of food was being carried out with offshore companies and not with Venezuelan public companies that for years have been dedicated to the importation of food. "Why are they going to these traders? Who is behind it? And that's how we got to Group Grand Limited, which is the company linked to Alex Saab, whose beneficiary until February 2017 was the son of Alex Saab, and the contact information of the registry of this company was the address in Caracas of Fondo Global de Construcción, another company of Alex Saab. With this company, Saab made a million dollar contract during the Chávez government for the issue of prefabricated homes," Deniz explained. Before publishing the articles, Deniz said he tried to communicate with Saab by various means to check all the information he had obtained with him. However, he never got an answer from him and could not include his statements in the reports, according to the journalist. Regarding the suit, what caught the attention of the editors of Armando.info is that they have been accused of defamation and injuria for articles whose investigations they say show evidence of their claims. One of the site’s co-founders, Poliszuk, told the Knight Center that he knew of defamation cases in Venezuela for opinion articles, but not for investigative articles. In the articles, Poliszuk said, "what we prove is (the existence of) a business, to which a businessman has had the luck of getting that big contract, which is nothing more and nothing less than who has had much of the business of the programs subsidized by the government in a country where hunger is the news. This is nothing personal, none of us knows the businessman, we did not know him, we still don’t know him." The defense lawyers hired by Deniz for the case also explained to the journalists another particularity of this complaint, he explained. "It is not usually common for a lawsuit to be filed for aggravated defamation and for injury (injuria) at the same time. It is usually for one of the two crimes, not for both at the same time," Deniz said. Deniz also emphasized that the suit was made in a personal capacity by businessman Saab, "the government is not suing us." However, the pressures that the journalists received after publishing the second article in September, and in the weeks following the subsequent lawsuit, increased. The same day of the publication of the second article related to Saab’s alleged ties with the Maduro government, a false Twitter account began to intimidate the journalists. The Twitter account @pepepragavzla, deactivated shortly after, published their identity cards and cell phones in threatening messages that alluded to the activities of the journalists’ families and their location. Both the National Union of Press Workers of Venezuela (SNTP), as well as the Press and Society Institute of Venezuela (IPYS) and the non-profit organization Espacio Público denounced and rejected the public threats. Regarding the threats, Poliszuk mentioned that they contained data that caused a lot of suspicion, for example, they used the acronym CC to refer to the identity document, but CI, for Cédula de Identidad, is used in Venezuela. The false account put the identification numbers of the Venezuelan journalists as CC, an acronym used in Colombia to refer to the Cédula de Ciudadanía. "It is a Colombian businessman that we uncover in these investigations. So, it is clear that everything (those threats) comes from the same work," he said. After the threats on Twitter, "from time to time we heard rumors that they were going to freeze our [personal bank] accounts, the site’s accounts, then, it was clear that they could prohibit us from leaving the country,” said Alfredo Meza, who like Scharfenberg was also a correspondent for the Spanish newspaper El País in Caracas before leaving Venezuela. They did not want to submit to a "travesty of justice," they did not think it worthwhile to receive a sentence for the simple fact of wanting to be "martyrs," Meza said. So, he added, they decided to privilege their security and to continue working for the site, and with that in mind they planned to leave the country. In the days that followed the lawsuit, Meza said that the lawyers recommended not to tweet about the case to expose as little as possible to the plaintiff and thus prevent the process from accelerating. But they continued to investigate and write a series of reports about their findings on Saab's alleged business with the Venezuelan government. "Alex Saab is a person who wants to cultivate a low profile but who, nevertheless, carries out business that impacts the lives of many Venezuelans, of millions of Venezuelans, and as long as that happens, we consider it a public interest issue that we are going to look at,” Meza said. This is not Saab's first suit against a journalist. Also in 2017, Saab filed a suit in Florida against journalist Gerardo Reyes, of Univision, who reported that the Colombian businessman and his partner Álvaro Pulido Vargas have made a fortune as contractors of the Venezuelan government. As for the plans of the four Armando.info journalists who are outside of Venezuela, their goal is to return to their country to continue doing investigative journalism. Colombia is a possible and temporary destination from where they plan to continue working, in case they can not return to Venezuela in the coming months. "We founded Armando.info almost four years ago to be able to do journalism without censorship. When founding Armando.info we promised ourselves, as it is a media of journalists, that we would not admit, in our own media outlet, the censorship that we suffered (in other media outlets). We were not going to allow ourselves to be silenced, for the investigation that is in progress to be abandoned. (...) Our goal is to keep reporting," Poliszuk said. The list of Venezuelan journalists in exile is long and growing. One of the most emblematic cases is that of director of the centennial Venezuelan newspaper El Nacional, Miguel Henrique Otero, who had to leave Venezuela in 2015 after being sued for defamation by the then-president of the National Assembly, chavista deputy Diosdado Cabello. Otero continues to direct El Nacional from exile.